IT organizations crave lower priced, seamlessly integrated server platforms purchased from and supported by a single vendor. Of all the competitors, Nutanix NX-3460 is the preferred choice by Modern Infrastructure readers and the Impact Awards panel of judges for best converged infrastructure product. Nutanix converged infrastructure brings virtualized servers together with storage and networking under one management platform for enterprise IT workloads. The Nutanix NX-3460 is a four-node deployment of the NX-3060. Each node runs with Dual Intel Ivy Bridge E5-2680v2 processors, two 400 GB solid-state drives and four 1 TB hard disk drives for storage, up to 512 GB of configurable memory and network ports for 1 or 10 Gigabit Ethernet or 10/100 BASE-T networking. Voters valued the true integration of the compute, storage and networking tiers, coupled with the product's building block design, over all else. The latter capability gives first-time users the option of testing CI with smaller deployments before committing to full-blown, large cluster installations. 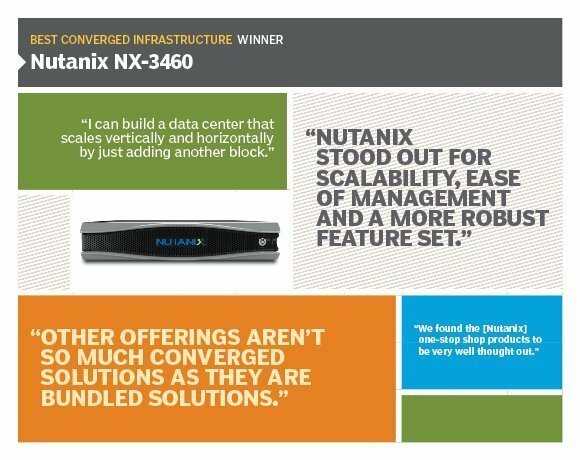 "We found the [Nutanix] one-stop shop products to be very well thought out. I like that I can build a data center that scales vertically and horizontally by just adding another block," said one reader. Is converged infrastructure the right move for all workloads, or just specific applications like virtual desktop infrastructures? At this point in development and implementation, a covered infrastructure is not the right move for our organization. It is used for very specific applications that include VDIs, but on the whole our system is not ready for full converged infrastructure implementations. After examine the technology and seeing where it is at in growth, we feel it better to wait for new updates to the methods until we adapt to a fully covered infrastructure.